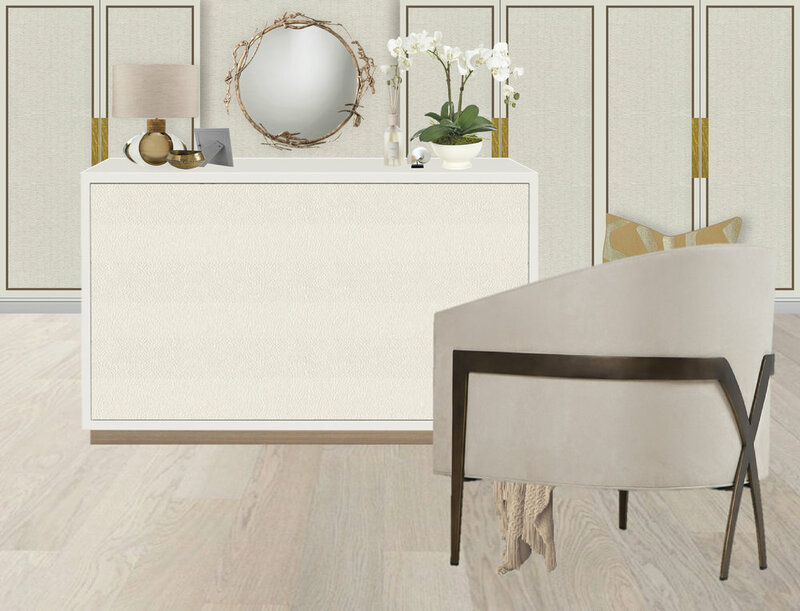 Taking cue from the ambiance emitted from a luxury hotel spa, Synonymous set out to design a dressing room that felt calm, serene and refreshing. The team started the scheme with a gorgeous patterned wallpaper insetted into the wardrobe doors, basing the entire room around it. Outlining the doors are strips of bronze metal, which further enhance their shape and uniformity. The custom shagreen island stores jewelry, makeup and seasonal garments. The showstopper is without a doubt the gorgeous glass fronted shoe wardrobe displaying them in an artistic way. As our signature touch, we added a delicate glass lamp on the island and structural lounge chair ideal for resting.